AMD named its new CPU cooler the Wraith, probably in an effort to conjure up the image of something that's both cold and quiet. The company's marketing team is incredibly confident in its latest thermal solution. Perhaps too confident. But we'll get back to that once we go over some of the comments made by Don Woligroski, AMD's global marketing manager of desktop CPUs and low-power APUs (and a former Tom's Hardware senior editor), during a briefing call last week. For now, AMD's FX-8370 is the only processor that comes bundled with the Wraith. The processor's price doesn't change as a result of the addition. Instead, any remaining FX-8370 processors with the old stock cooler are getting a discount. AMD's other 125W CPUs don't get the Wraith (for now). Whether they ever do will likely depend on the Wraith's success with its FX-8370. At any rate, at least AMD's 95W processors get an updated CPU cooler. It's nice to see that the company is finally paying some attention to its bundled CPU coolers, which typically get the short end of the stick outside of the system integrator arena. AMD's goal was seemingly to provide just as much cooling headroom as absolutely necessary for the lowest possible price. Acoustics never appeared to be a big concern, which is why enthusiasts deride the stock experience so often. The Wraith is noticeably larger thanks to its increased surface area. As usual, AVC (Asia Vital Components Ltd.) is the OEM that actually builds the coolers for AMD. Consequently, there's nothing new and exciting to be reported about how the Wraith is constructed, since we know the manufacturer's work from AMD-, Cooler Master-, and AVC-branded products. 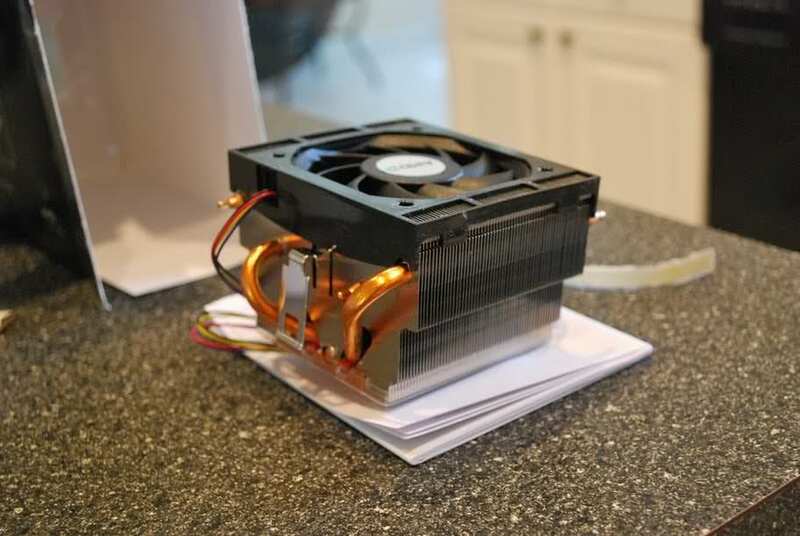 AMD's Wraith weighs in at 455g, which is a whopping 125g more than the old stock CPU cooler. It also has larger dimensions. It stands 8cm tall, is 10.4cm deep and has a width of 17.8cm measured from the end of one heat pipe to the end of the opposite heat pipe. 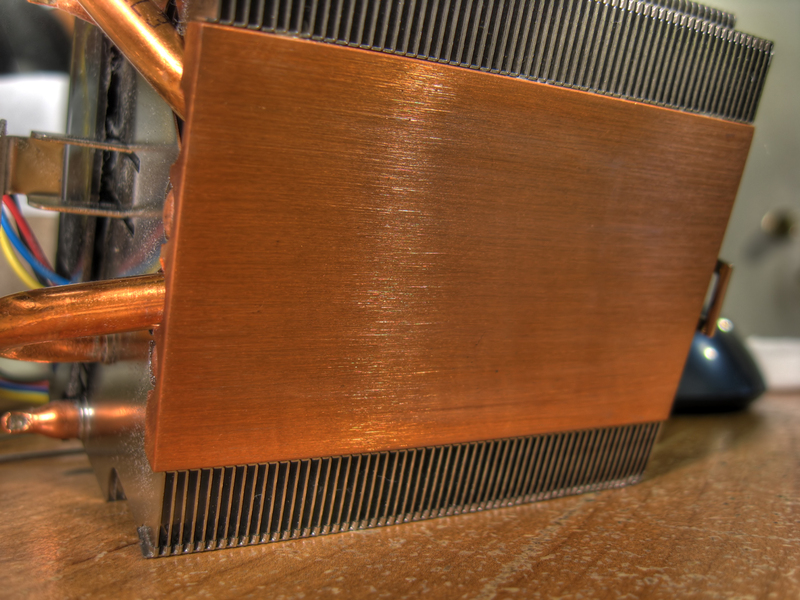 The heat sink consists of two parts, which are stamped together. It contains a total of four 6mm pipes made of a copper composite material. These are supposed to distribute waste heat evenly across the aluminum cooling fins that are also stamped in place. Once the Wraith's cover is removed, we find an old friend: the QFR0912H by Delta. This model has a 92mm fan that's 25.4mm thick and runs at up to 3200 RPM with 5 to 13V, consuming a maximum of 2.64W. At its peak voltage of 12V, we measured the RPM at exactly 3100. This particular fan costs less than $5 if purchased in large quantities, which doesn't exactly make it an expensive offering. However, it's not cheap either, and is most certainly a step up from the fan that was included on AMD's previous stock CPU cooler. AMD's logo can be found hidden behind the Wraith's cover. The logo lights up once the Wraith becomes active, but when it's off, it is barely noticeable. This effect is achieved using a special coating, which is applied on the letters in a raster pattern. Finally, a circuit board with its three SMD-LEDs and corresponding resistors is found behind the cover. It is connected via a thin 12V power cable, which is hidden between the cooler and its cover during assembly. The Quietest High-End Cooler For Less Than $50? There are a couple of statements to note. First, the Wraith is a high-end cooler and AMD couldn't find a CPU cooler for less than $50 that was as quiet as the Wraith. To be fair, we're not going to take the high-end cooler category moniker too seriously. After all, the Wraith should cost less than $15 to make and, short of a miracle, that means it just can't truly be a "high-end" cooler. It should be significantly better than all of the cheap $5 entry-level CPU coolers, though. Consequently, we're having the Wraith compete against AMD's old 125W stock cooler to see just how big of a difference there really is between the two. We're also throwing the Thermalright Macho Rev.B into the mix, which represents the upper mid-level CPU cooler category and sells for the equivalent of around $50 in most countries. We could have added some less expensive models that perform similar to Thermalright's Macho and are closer to the Wraith by also using a top-down airflow design, but we wanted to show that an ultra-quiet tower CPU cooler doesn't always have to be, and sometimes shouldn't be, the obvious choice. We'll get back to this point in just a little while. First, let's take a quick look at our test setup and then turn our attention to the results.